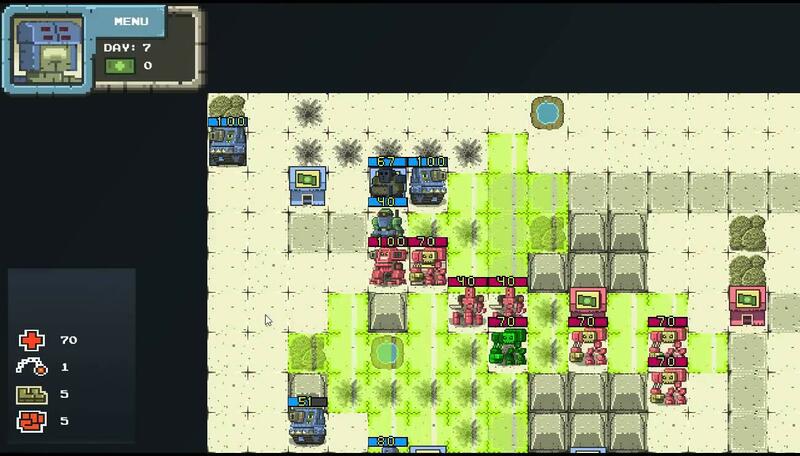 Mutant Gangland is a fast, neat and simple turn-based-strategy game where mutants fight robots . Build units, Conquer buildings and use them to Fund your army. Battles are short but the game packs 50 quick battles and a level editor to design your own maps. I first introduced you to this game back in November 2013 with it's promising visual style and game-play, what is pleasing to hear is that have taken tester feedback and will be adding online play in future, how about that! The plan is to release the game on itch.io at the end of this month, it will still be an early version so don't go into it expecting the full experience just yet. - DRM free for all platforms (Windows/Linux/Mac and Android), distributed via itch.io - (for now, due to it's ease of use and no cumbering clients) in a buy once get it on everything I can build for fashion. Quote Besides this we've also decided to Open Source the game's source code for non-commercial use, alongside the binaries of the game. Reason for this, besides allowing anyone to change it to their taste or tinker with it, is to allow those that bought it to play it/build it on platforms I cannot support (or build for). Everything looks pretty tight in that trailer and I cannot wait to get my hands on a copy to mess about with, what do you think folks? Non-commerical licenses aren't open source though :/ I can understand using an NC license for the artwork, but not the code. That means other people can't start a crowdfunding campaign to hire someone to add new features. Quote from W Non-commerical licenses aren't open source though :/ I can understand using an NC license for the artwork, but not the code. That means other people can't start a crowdfunding campaign to hire someone to add new features. If the source is open, then it is open source as far as I am concerned. I don't agree that for something to be "open source" it has to have a fully open license. Something can be open source, but still have restrictions on the license, the GPL one of the widest licenses has restrictions in it people seem to forget. You are mistaking "open source" as "free software". If you've ever listened to Stallman, he always states there is difference between the two terms. Open source means that the code is there for people to inspect, free/libre software (by GPL) means that the code is distributed publicly and derivative work can be published as long as the derivative is also licensed under GPL and follows their terms. In this case the software is indeed open source, but not free software as the license restricts you from making your own commercial derivative. To me that sounds pretty fair and gives the users a lot of freedom when compared to most commercial software out there. Quote from Samsai If you've ever listened to Stallman, he always states there is difference between the two terms. Yes, a very important distinction. Both are very useful, but free software (as you rightly state) has greater advantages for the community, while openness has (arguably) more advantages for the creator, by limiting the freedoms of those sharing in the sources. The reason it's "arguable" is that there are numerous cases in which community benefits have exceeded others. Stallman sadly has a difficult time articulating that ideal without alienating broad groups of contributors. Either way, however, I enjoy reading through the sources of game projects, despite their licensing quirks, especially code from commercial games (ASYLUM's Dagon Engine, Shadowgrounds, Penumbra, Gish, Introversion's source code, etc). I don't always understand all of what they're doing, but it has benefited my understanding of games programming, and I appreciate the courage of devs who share the sausage-making with us. Quote from s_d I appreciate the courage of devs who share the sausage-making with us. Thing that terms is the best way to describe the source code right now. To make things a bit clear, I'm licensing the game under Creative Commons 3.0. for Non Commercial usage, and this is only to avoid having someone re-packaging the game and selling it on the app store / android market. I really want players/users to be able to fully use what they bought and alter it or play it as they see fit and share their changes with others if they deem so. Great to see it going open source. Real shame about the NC clause as it then can't enter the Debian main archive. Can we please stick with the official definition of the term "Open Source" according to which NC is not acceptable. Quote from wassersturm Can we please stick with the official definition of the term "Open Source" according to which NC is not acceptable. That is only "official" if you are part of or follow them. They don't speak for everyone. Open code is open, open source and free software are different. Obviously a rip of the old Game Gear game "Head Buster", but it's even worse since Head Buster had attack animations for all available robots and weapons.